Igloo TrailMate Wheeled Cooler. Ultratherm insulation in body and lid for extended ice retention performance (4 days). Glide slide-and-lock horizontal locking telescoping handle technology provides better leverage and reduces the lifting load. Cool Riser Technology keeps contents cooler for longer by elevating away from hot surface. Features: aluminum telescoping handle and skid rails, stainless steel screws, tie-down loops, water resistant dry storage box, dual built-in bottle openers, 4 built-in cup holders, butler tray on handle, exterior storage pocket, and threaded drain plug. Never-flat wheels tackle sand and other challenging terrain. Holds (144) 12 Oz. Please allow 24 hour processing for all orders placed. Not satisfied with part or all of you order just send it back within 30 days. Our goal is 100% satisfaction for our customers. We stand by the products we offer for sale. 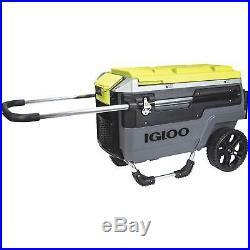 The item “Igloo TrailMate Wheeled Cooler” is in sale since Thursday, October 18, 2018. This item is in the category “Home & Garden\Yard, Garden & Outdoor Living\Outdoor Cooking & Eating\Ice Chests & Coolers”. The seller is “essentialhardwareusa” and is located in Nationwide Distribution. This item can be shipped to United States, Canada, United Kingdom, Denmark, Romania, Slovakia, Bulgaria, Czech republic, Finland, Hungary, Latvia, Lithuania, Malta, Estonia, Australia, Greece, Portugal, Cyprus, Slovenia, Japan, Sweden, South Korea, Indonesia, Taiwan, South africa, Thailand, Belgium, France, Hong Kong, Ireland, Netherlands, Poland, Spain, Italy, Germany, Austria, Bahamas, Israel, Mexico, New Zealand, Philippines, Singapore, Switzerland, Norway, Saudi arabia, Ukraine, United arab emirates, Qatar, Kuwait, Bahrain, Croatia, Malaysia, Brazil, Chile, Colombia, Costa rica, Panama, Trinidad and tobago, Guatemala, Honduras, Jamaica, Viet nam.